I have some great news! I popped into the Pound shop to buy some tissues and was faced with a bunch of Revlon polishes! :O *gasp! * But these polishes cost so much! how could they be here for only a pound?! Today I'm gonna show you Grape Fizz :) It's suppose to smell like grapes and it does! The smell is so strong that I could smell it while crocheting! Even when I added topcoat I could still smell it, I thought that maybe the topcoat would take away the smell but it had no effect on it! I absolutely love the little fleckles in it! They're like gold and so damn shiney! 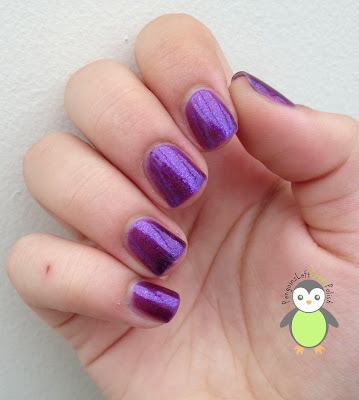 I have to warn you all that most of the Revlon Fizz Scented polishes are so very sheer, Grape Fizz took about 4 coats to make it opaque and even then the nail line was visible. I didn't mind this!